The Oppo Reno is already one of the most talked about camera phones around, thanks to its potentially game-changing optical zoom. But this latest leak firmly focuses on the pop-up camera - and what a pop up it is. Now, pop-up cameras aren't new on smartphones. Oppo itself released the Vivo X in 2019 which had a pop up. Then there was the Vivo Nex. 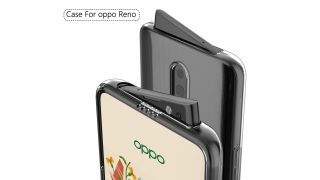 The Oppo Reno is set to also do this, according to the latest leaks, and its pop-up camera is the strangest-looking yet. It's shaped like a triangle and when popped up looks like a shark fin navigating choppy smartphone waters. The pop-up is said to house a 16MP camera. Don't get us wrong, this is strange good, not strange bad. Every Oppo Reno leak we have seen so far fills us with a little bit of joy. From an imaging point of view, Oppo is really trying to create something unique.